OMG! That's genius! I am so gonna do that when I get to UNC. It's awesome! To think...someone has fun doing what I do for a living? How funny. After 20 years with Lockheed I think I can speak to slides with foreign languages. 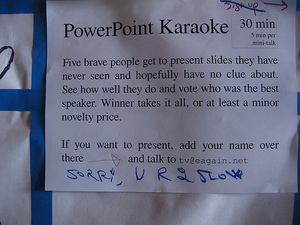 I have created a Powerpoint Karaoke App using the www.slideshare.net API.